Butte County is a mid-sized county containing a large chunk of the mountainous terrain where the north end of the Sierra Nevada merges into a complex of ranges that become the Cascades. It was one of the original 27 counties of 1850 but was then much larger. Subsequently, Plumas County and much of Lassen County were carved out of its eastern half. The west end of the county is anchored at Chico in the Sacramento Valley; Bidwell Park is a well-known urban park there. The Feather River runs through the middle of the county, and the large reservoir of Lake Oroville sprawls over much of its current southeastern portion. Thermalito Forebay and Afterbay are important birding spots. In the southwest, Gray Lodge WMA, along with Upper Butte Basin WMA and the Llano Seco Unit of Sacramento River NWR, host thousands of waterfowl in winter. For Butte County, I chose this shot of a Hammond's Flycatcher on breeding territory. As is typical of this species, it is perched rather high in the canopy, but you can still see the very short bill, very short tail, and long primary projection. My other two shots are from an oxbow of the Sacramento River in Bidwell-Sacramento NWR, right on the western edge of the county. 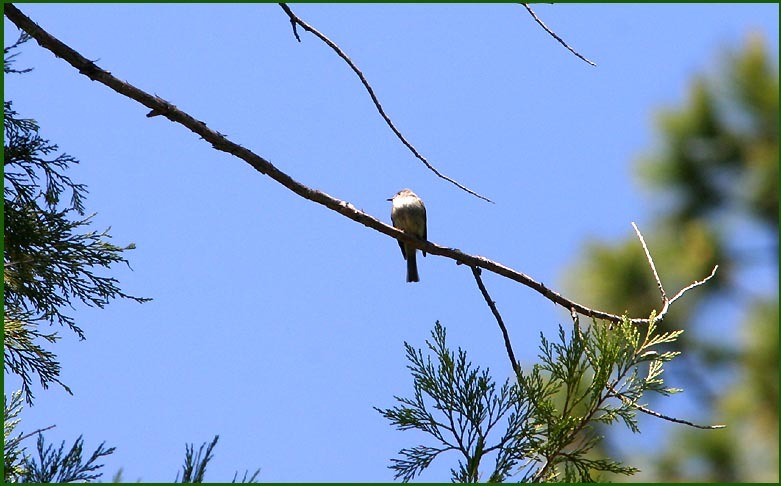 The native oak woodlands here have Ash-throated Flycatcher (below left; note the useful tail pattern). These oak woodlands abut the oxbow lake, and during our early morning visit, a family of River Otters were dining on crawfish. I like this shot (below right) of one otter and the colorful breakfast, set against the golden reflections on the still pond. Yes, it is not a bird. Sometimes I cheat. Here is that oxbow lake at Bidwell-Sacramento NWR (upper shot, below). One can undertake a fine transect of California life zones in Butte, from the Sacramento River into the high Sierra. The bottom photo shows a rushing stream well up Humboldt Road, near the end of the pavement at Jonesville (both photos 20 June 2006).